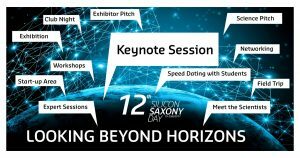 With the slogan ‚LOOKING BEYOND HORIZONS‘, the members of the Silicon Saxony e. V. and representatives of the high tech branch, sciences, research and public institutions will meet again for the 12th time at the Silicon Saxony Day in Dresden. This event presents innovative ideas and trends regarding the main topic ‚Looking beyond horizons‘ in a two days forum at the DGUV Congress in Dresden. Interactive sessions and accompanying exhibition will give the possibility to look beyond horizons and get a glimpse of impulses and future technologies. This year, Fabmatics supports the Silicon Saxony Day as Gold Sponsor together with the members of the Automation Network Dresden (AND). Fabmatics also participates the Speed Dating event. Here you will find some more information about the Speed Dating: http://www.silicon-saxony.de/silicon-saxony-day/conference/speed-dating-with-students/.